Northern Ireland is comprised of six counties of the province of Ulster. This beautiful part of the world is filled with historical monuments and areas of natural beauty, and offers many interesting things to do and to see. 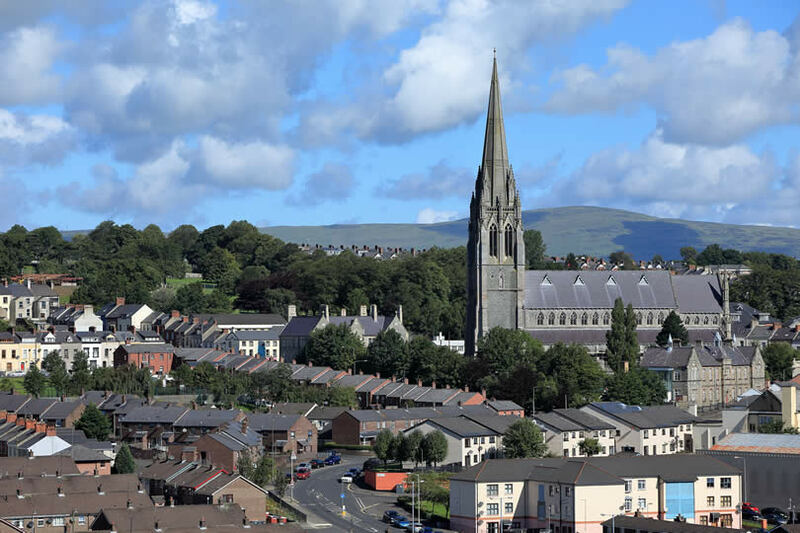 Daily flights to Belfast and Londonderry cities operate from major airports all over the UK. Car hire is available at air terminals, as are travel connections by rail and coach. Ulsterbus offers an intercity service to major towns in the province. You can also travel by ferry from Stranraer in Scotland to Larne in Co. Antrim or directly to Belfast. Look for cheap accommodation online, in bed and breakfast, hostels, and in budget hotels. The following eight attractions are highly recommended on your first trip to the province. A visit to the Giant’s Causeway on the Co. Antrim coast is absolutely essential. 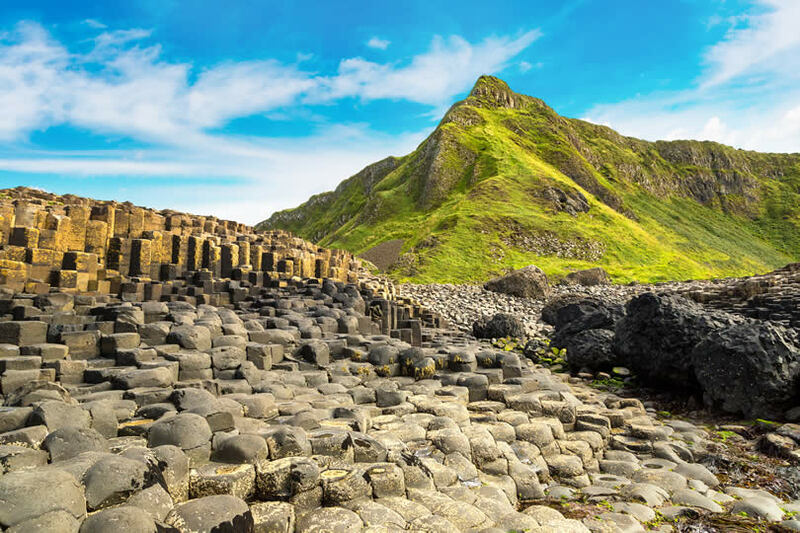 Legend has it that Finn McCool, an Irish giant, built the Causeway in response to a challenge from Benandonner, his Scottish counterpart. 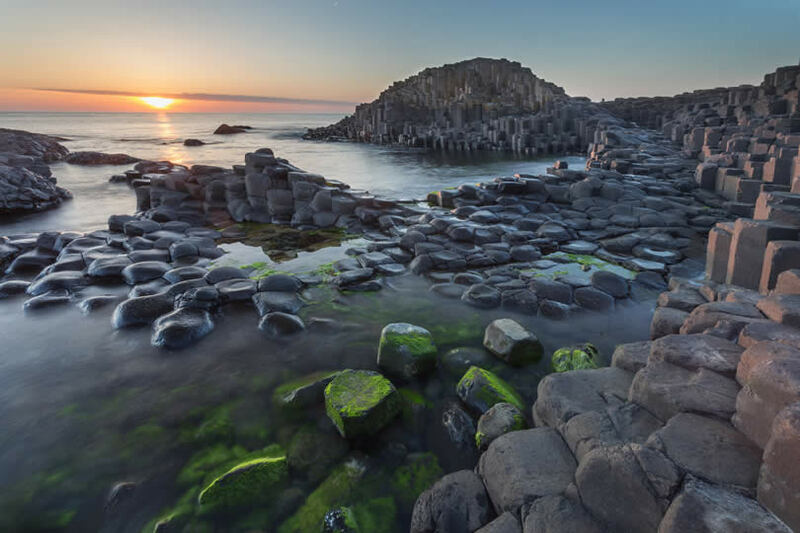 A World Heritage Site, the Causeway is a formation of about 40,000 basalt columns, the result of ancient volcanic activity. Their hexagonal shape ensures that the columns interlock and form a walkway along the coast. In addition to the extraordinary geology, the rocks harbour unusual plant and animal species. Best seen at low tide, you can travel by the Causeway Coaster, a bus service that leaves from the Causeway Centre. 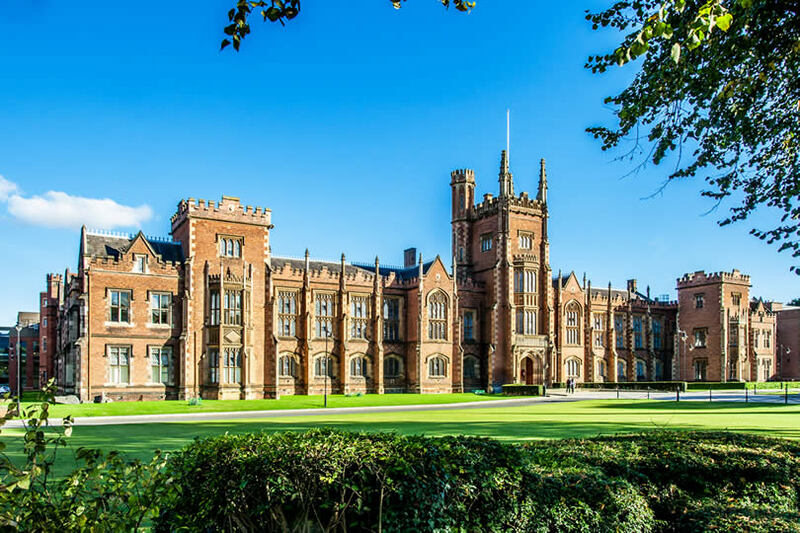 South of County Antrim is Belfast, the capital city of Northern Ireland. Like all cities, it is divided into districts that have their own character. Spend time in an Irish public house, go food shopping (on Fridays) at St George’s Market, or visit one of the city’s many historic buildings. Inside of St. Anne’s Cathedral on Donegall Road, graceful Romanesque arches soar over the transept. Works of sacred art that have been created since the cathedral opened one hundred years ago, are on view. Belfast is situated at the mouth of the River Lagan, which feeds into the sea. This location enabled the city to become one of the world’s ship-building capitals. In a tribute to those glory days of industry, visit the Titanic Park. Designed to look like the prow of a ship, this modernist building marks the site of the former Harland & Wolff shipyard. Near the entrance you can see the Titanica sculpture of a female diver, by artist Rowan Gillespie. Inside the building are retail, conference and dining facilities, and an exhibition charting the history of the ill-fated Titanic ship. Outside, the Titanic slipway is used for concerts and other public gatherings. 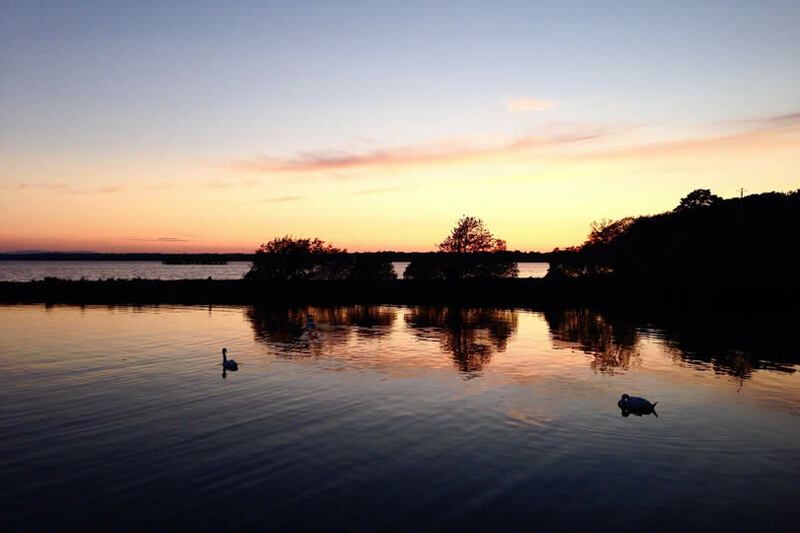 Just outside Belfast is Lough Neagh, the banks of which touch four Ulster counties. Once again, we have Finn McCool to thank for an extraordinary geological feature. He scooped a large piece of earth and tossed it towards Scotland – probably at Benandonner. Alas, it fell short, landed in the Irish Sea and became the Isle of Man. Because the Upper Bann and the Blackwater rivers flowed into the leftover crater, we have Lough Neagh to visit today. It is the largest freshwater lake in the British Isles and one of the twelve chief lakes on the island of Ireland. This is a place of incomparable beauty, a haven for bird-watchers, photographers and eel fishers. By the 1100’s, the Norman Conquest had vanquished Finn McCool forever. This cleared the way for knight John de Courcy to build a fortress on the shores of Belfast Lough, eleven miles from the city centre. 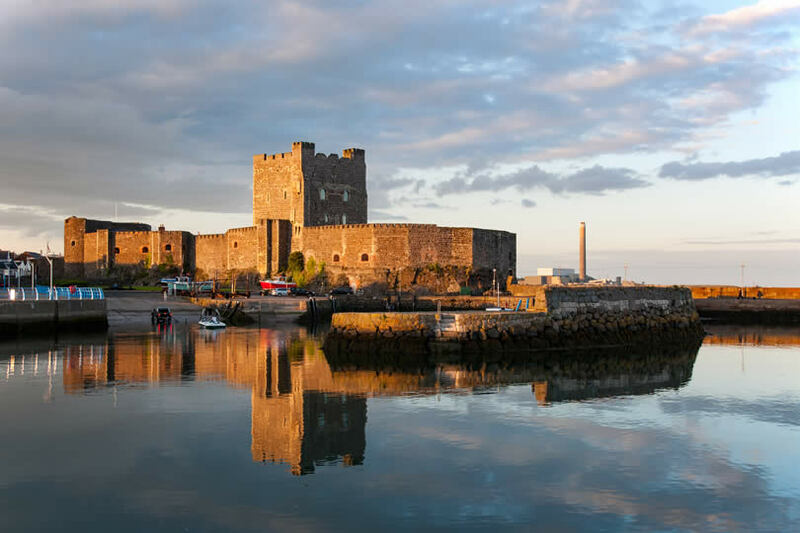 Over the centuries, this fortress became Carrickfergus Castle, and its history is entwined with that of the province. Today, its formidable castellated profile dominates the Carrickfergus townscape and it is open to visitors. The castle has altered much over the centuries, though fragments of the original building remain, including a seaward curtain wall. Attractions include a display of historical canons and a terrific view of Belfast Lough from its high viewpoint. To visit the incomparable Mourne Mountains, take the train south and embark at Newry railway station. Do not be under whelmed by the soft, sweeping hills that surround a number of pretty lakes and reservoirs; this is the highest mountain range in Northern Ireland and hundreds of walkers, climbers and cyclists come to experience them, every year. A designated national park, the mountains are home to several species of grass plants and birds, an attraction that photographers and artists should not miss. 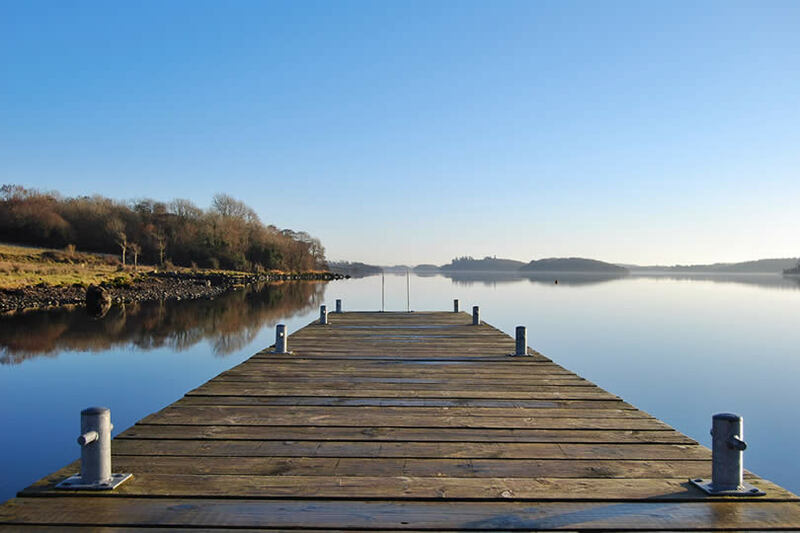 Filled with the delights of the Mourne Mountains, travel west to the town of Enniskillen, on the shores of the River Erne. This river feeds into two great lakes, the upper Lough Erne and the lower Lough Erne. Named after local Celtic goddess, Erainn, Finn McCool didn’t get a look-in. Because of the extensive shoreline and the many lake islands, one hundred and fifty-four altogether, your only difficulty will be deciding what to do. Available sports include angling, rowing and water skiing. Be aware that in stormy weather, ocean-height waves can form on the surface of the lakes, restricting these activities. When you have finished enjoying Lough Erne, turn northeast to Londonderry City, colloquially known as Derry. It is situated on the River Foyle and is the only city in Ireland to retain its complete, historic walls. The area within this wall is known as the “Diamond” and encompasses beautiful Georgian and Victorian buildings. On Bishop Street, you can view the elegant, classical exterior of the courthouse, while the seventeenth-century St. Columb’s Cathedral is on London Street. By now, you will be ready to mark your visit to Northern Ireland by going shopping, and both the Foyleside Shopping Centre and the Richmond Centre offer retail solutions. Long-distance buses go from the Foyle Street station to destinations all over the province. You can board a bus to return to Belfast or Derry airports, or travel south of the border to extend your Irish adventure.